Are you looking for a metal fabricating company that specializes in quality CNC wire bending? Look no further! AWC Industries is a custom wireform manufacturer that serves a wide variety of industries across Chicago and Illinois. We have the capability, knowledge and experience to produce a variety of wire forms up to and including 1 inch diameter, in addition to our other fabricating services. AWC Industries specialize in high end wire forming and metal bending. We offer wire forming services for ferrous as well as non-ferrous substances such as aluminum, brass, copper, steel and stainless steel. Our state of the art CNC wire forming and fabricating facilities can produce the highest quality finished goods. Pole Style Plant Hangers, Decorative Wire Forms, Wire Racks and SO much more. AWC Industries use a combination of mandrel wire benders, press wire benders, draw wire benders, Vaill wire end formers and Tauring 3 ring wire rollers to produce our finished goods. 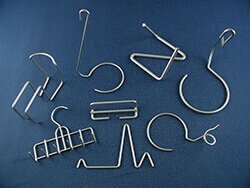 No matter what shape of metal wire you want, whether it is round, oval, square or rectangle, we can help you meet your needs. Besides bending wires into various types of desirable shapes, we also provide them with fine finishing either with chrome plating, zinc plating or powder coating. Call the Wire Forming Experts of Illinois today. We look forward to serving you. Powder Coating the Colors of Spring.